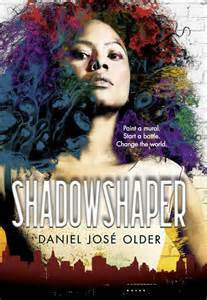 Shadowshaper, by Daniel José Older (Scholastic, June 30th, 2015), is a gripping new YA fantasy that just goes to show that there's a lot more magic out there than is found in medieval Celtic inspired otherworlds. The heroine, Sierra Santiago, is a Puerto Rican teen living in Brooklyn, who finds that her family are Shadowshapers, able to infuse two-dimensional art with the spirits of the dead. She does not find this out in a pleasant, "oh gee I've got magic!" sort of way; instead, she finds it out when people she's known all her life start dying, and malevolent shadow creatures come for her. So I would say that I am not particularly drawn to "urban fantasy" mainly because I find urban settings kind of gritty and unappealing, in real life and in fiction. But Sierra's Brooklyn is not defined by grit. Instead it is a place of memories and meaningful connections; it is Sierra's Place. And I do like a strong sense of place and belonging, so the urban-ness of Brooklyn didn't impinge on my enjoyment. And likewise, though Sierra, an African-American-Puerto Rican urban teen, doesn't overtly mirror my own life experience, she is Real enough to simply enjoy spending time with, and her concerns about family and her feelings toward Robbie and her self reflection (happily self reflection that's primarily positive, rather than body image critical) are eminently relatable. The dialogue is fast paced and full of non-standard English, making things simultaneously realistic sounding (to me, for what that's worth) or unfamiliar (I think age as much as anything is a big contributor to the unfamiliar factor for me). But I guess the point I'm trying to make is that it's not a book I read thinking "oh wow this a mirror into lives not at all like my own teenage years" and more a book I read thinking "oh wow it is fun to read a fantasy that goes in directions that aren't along well-oiled tracks." At the risk of sounding banal, I can, with confidence, say that Shadowshaper struck me as "fresh," "vibrant," and "gripping." Academic me also was very interested in the villainous anthropologist; the tension of the neo-colonialist outsider appropriating indigenous culture is very real in the real world, and it is was interesting as all get out to see it driving a fantasy story! I want to read this one after all the good reviews. It sounds like it would be good for getting out of a rut. YAY. I have this out from my library right now, along with a ton of other amazing books, and I am verrrrry excited to read it. I've heard a lot of good things about Older's earlier books, and my library keeps on not having them, which is MADdening. At last I'll be able to be on the Older train!